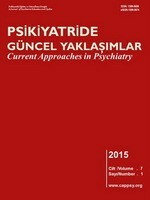 Psikiyatride Güncel Yaklaşımlar / Current Approaches in Psychiatry is an online peer reviewed bilingual journal aiming to publish updated current review articles (and research articles as special issues) on all aspects of psychiatry and related sciences (i.e behavioral sciences, psychology, psychopharmacology, neuropsychiatry, neurosciences, psychiatric nursing) in Turkish and English. Journal also publishes a special issue which includes only research papers in every volume in addition to quarterly issues including only review articles. The authors could submit their articles via Dergipark online submission system. There is no article submission or processing charges in this journal. Authors of Turkish manuscripts are requested to send English version of their manuscripts after acceptance of article. Journal currently welcomes review articles for 4th standard issue of Volume 11, 2019 and research articles for research special issue of Volume 11, 2019. We welcome all articles on psychiatry and related sciences. *This is the mirror site of the journal. Original web site is psikguncel.org for your records.